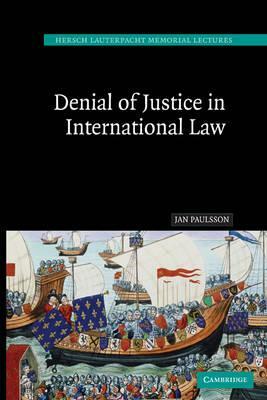 Denial of justice is one of the oldest bases of liability in international law and the modern understanding of denial of justice is examined by Paulsson in this book, which was originally published in 2005. The possibilities for prosecuting the offence of denial of justice have evolved in fundamental ways and it is now settled law that States cannot disavow international responsibility by arguing that their courts are independent of the government. Even more importantly, the doors of international tribunals have swung wide open to admit claimants other than states: non-governmental organisations, corporations and individuals, and Paulsson examines several recent cases of great importance in his book. Acknowledgements; Authorities; Abbreviations; 1. The Renaissance of a cause of action; 2. The historical evolution of denial of justice; 3. Three fundamental developments; 4. The modern definition of denial of justice; 5. Exhaustion of local remedies and denial of justice; 6. Denial of justice by outside interference; 7. Denial of justice by the decision-maker; 8. Remedies and sanctions; 9. The menace of 'obscure arbiters'? Review of the hardback: 'Paulsson has a gift for presenting historical perspectives in a way which makes the reader appreciate the effects in modern doctrine and practice ... This book is a model in terms of focus and disciplined presentation.' International Affairs "Denial of Justice in International Law does a remarkable job of illuminating a cause of action which has not yet received in depth scholarly attention since 1938."